After reviewing the do-files carefully, we suggest two small corrections that would bring the author’s estimates more in line with the official calculations and with the previous blogpost. First, on line 128 of the EICV4 do-file (and EICV3-different line) we suggest to use actual or at least regional prices in the first instance, and only use national averages where price information is missing. This is because regional price variations can be significant in Rwanda, thus leading to an overestimation of the value of consumption in poor regions. Secondly, on line 151, and 225, we suggest using information about the number of months in which the item was consumed (s8bq2 and s8cq2) in order to scale up to yearly consumption values. This is because poor households may only consume the crop at harvest season, whereas richer households may be able to consume the crop all year round. So we would underestimate the gap between poor and rich households’ consumption without this adjustment. If these two changes are made, the increase in poverty at 30% inflation goes from +1.2% to +5.2%, which is very close to earlier obtained results. The rest of the difference can be accounted for by the fact that this study does not consider non-food consumption, and other methodological differences between the two papers. With this small amendment, the most important contribution of this paper is probably that it has confirmed the increase in poverty using what appears to be a third source for the price data, namely the ESOKO price dataset. 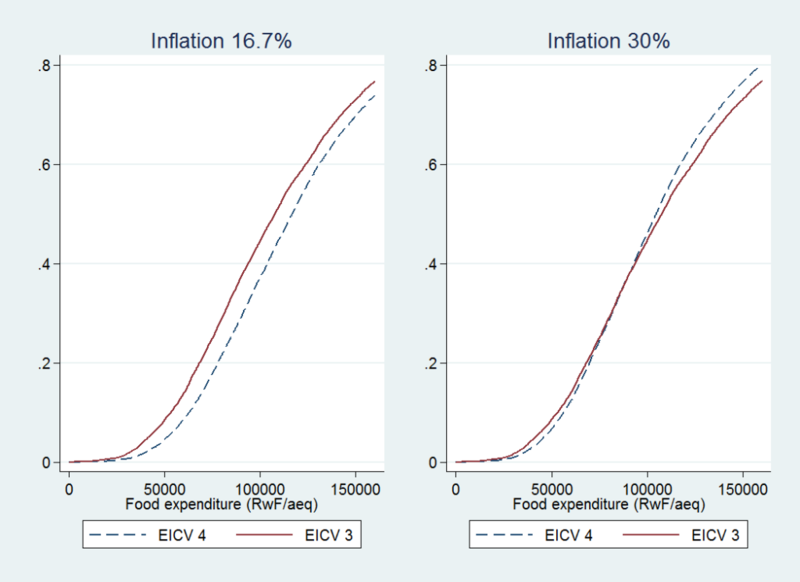 So it seems that we now have up to three different sources indicating that poverty increased significantly between 2010 and 2014 in Rwanda: (1) The “Institute of Statistics of Rwanda/ Price Statistics Division” cited in the original NISR study (NISR 2015, p.16); (2) The EICV price data used in this study and the previous ROAPE blogpost; (3) The ESOKO price data. This suggests that the findings are very robust and puts the onus on NISR to explain why the CPI data used in the official report yields such different results. As the author rightly points out, understanding what happened to inflation is key to understanding poverty dynamics in Rwanda, due to the type of transmission mechanisms at work in the agricultural sector. There are at least two possible reasons why CPI data may not give an adequate picture of poverty dynamics in Rwanda (assuming that the CPI data are not just wrong or doctored). First, CPI data are not modelled on the consumption patterns of the poorest households. In Rwanda, consumption patterns of poor rural susbsistence farmers can be quite different from those of the average consumer, due to high inequality and a strong urban/rural divide. 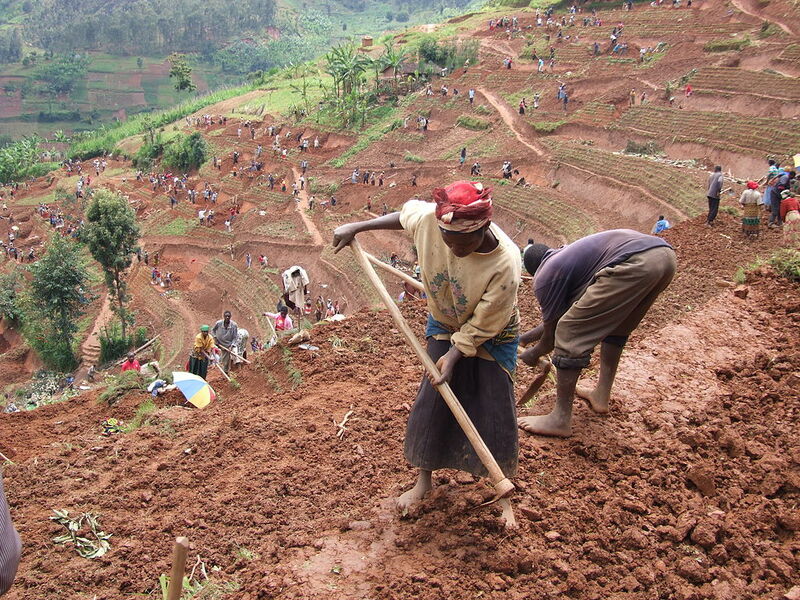 Second, CPI data focuses exclusively on consumer end-prices and therefore does not capture the complex mechanisms through which impoverishment occurs in Rwanda: Forced monoculture, coupled with poorly functioning markets and infrastructure, means that over-production of mandated crops often translates into localised price collapse at harvest season. The surplus production is purchased at low prices by local authorities and stored in warehouses to be re-sold when prices have recovered. This means that farmers sometimes have to buy back their own production at a loss, leading to further impoverishment of already vulnerable farmers. Those familiar with Rwandan history will recognise worrying patterns from the country’s previous disastrous experimentation with agricultural reform and mono-cropping in the early 1990s. Understanding exactly how these mechanisms work is key to preventing policy failure that are having devastating consequences on Rwandan farmers, and could have wide-ranging implications for national and regional stability. Unfortunately, the total impossibility to acknowledge, let alone discuss, these issues in Rwanda, means that corrective measures cannot be taken. Many thanks for your valid comments and for carefully examining my do-files! 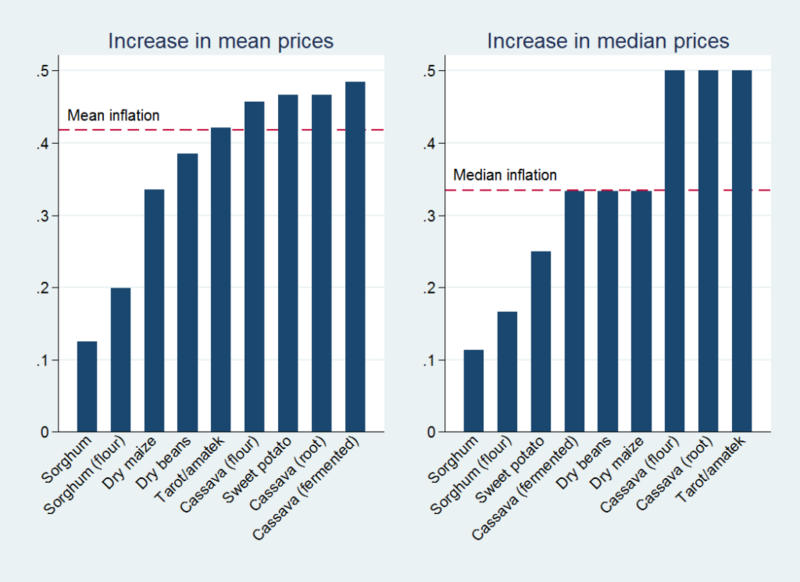 Regional prices: I agree that there is quite some variation in prices between regions and that it is better to use regional prices when converting own food production in its monetary value. The reason why I calculated national prices is that there are relatively few observations (i.e. often less than 200 for the main crops per province). I am not sure if we can accurately estimate regional prices given the limited number of observations. Number of months the item was consumed. This is in my view a trickier point and I do not fully agree with your suggestion to use this variable to scale up to yearly consumption values. The main reason is that it’s unclear to me how I should do this. Simply multiplying food consumtion and the number of months in which it was consumed does not seem correct. Assume for instance that the respondent did not consume the food item prior to the interview, but reports having consumed the item 11 out of 12 months (i.e. the only month it was not consume was the month of the interview). In this case, I cannot scale up because I have no idea how much the household consumed in every month. Similarly, even if the household consumed the item prior to the interview, I don’t like to assume that the household consumed exactly the same amount in all the other months in which the item was consumed, and that’s precisely what we are doing when using this variable to scale up to yearly consumption. I nevertheless tried to follow your suggestion (but still using national prices), but could not replicate your finding. I even found that poverty did not longer increase (with an inflation of 30%), but remained constant. It is, of course, possible that I did not program it correctly or did not correctly interpret your suggestion. I did not discuss it in the blogpost, but as a robustness check, I also verified whether the number of food items consumed and the number of food items times the number of months in which it was consumed increased between EICV 3 and EICV 4. The assumption is that dietary diversity should increase if poverty decreases. Using these rough measures of dietary diversity, I observed that it remained constant between the waves. Thanks for these clarifications. In the interest of clarity, we copy below the exact syntax required for the suggested modifications. In the syntax files of the original (anonymous) blog post, you will find the full set of assumptions and syntax codes used in the original study, which we believe address several of the concerns raised in Sam’s response. Until NISR publishes its own syntax files, however, we cannot know which set of assumptions most closely correspond to those used in the official calculations. As Sam rightly points out, the two studies use very different methodologies and are therefore not directly comparable, so we should not expect to find identical results. The fact that we still find similar trends (although at different levels), should, however, give us a great deal of confidence in validity of the results. Furthermore, Sam has added a number of important robustness checks, which further confirm the findings. With all this body of publicly verifiable evidence, it is very surprising that neither NISR nor the researchers involved in the official study, have come out to defend their results and to subject them to public scrutiny, as we have done here. It is also surprising that none of the donors who funded the EICV study, nor those who fund Rwanda’s poverty reduction strategy, have come out to request a clarification and verification of these issues. In fact, the World Bank and UNDP still quote the official EICV4 poverty figures on their country websites as proof of the success of their support to the Rwandan government. Their misguided songs of praise echo their own writings on Rwanda from before 1994 (https://books.google.com/books?id=6STNTT8g14MC&pg=PA162&lpg=PA162&redir_esc=y). Rwanda: What Makes for a Tolerable Dictator? Is Rwanda's Paul Kagame Becoming a Tolerable Dictator?